If you are looking for the quietest motorcycle helmet then perhaps this Schuberth C3 Pro Review will give some positive insights. When you consider that it transfers just 84 dB when the rider is cruising at 65 mph. That is impressive. Schuberth have been able to implement into the C3 Pro a tighter sealing neck roll. This is all credit to the front flip design and its greater ease. In addition, what is called ‘Tubulators’ that are on the visor also further decrease turbulence. This is typically a classic problem area for riders and designers. On testing this helmet at high speed on the highway and on winding side roads, and it is quite. It also feels great and won’t be a burden in wearing you down and feeling lethargic. For the past 70 years, Schuberth technology in head protection, have been the innovative technological leaders. In auto-racing, fire fighting, police, military and of course motorcycle. The company is based in Germany (Magbeburg) and is a award designer of helmets for a variety of uses. 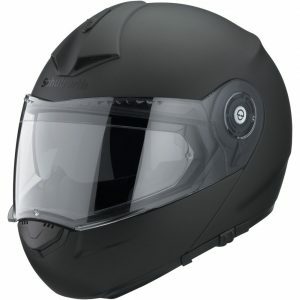 Schuberth is highly regarded with a top reputation for protection, excellent design and durability. This helmet has a revolutionary design with an aerodynamic shape that is suitable for high speed racing. Interestingly the helmets are made by hand and not mass produced on the assembly line. This is very significant as it means that you are not just getting a canned product that is massed produced. Very much quality and personal value has been put into each of the helmets by human touch. On the outside of the helmet is a shell material combining of fiber and carbon that provides the lowest weight possible, but also giving the most powerful strength. The design inside the helmet for the inner shell and lining, offer maximum shock absorption and with a good fit for comfort. One of the things about Schuberth is that they truly respect and value their clients. They listen to the feedback they receive to make an even better product. This has result in improvements that have been integrated into the helmet design based on what actual motorcyclists had to say. Several features of the precision fitting and visor adjustability have been implemented by the company’s engineers while developing new models including the C3 Pro for Women. This helmet is very quiet and will certainly benefit your audio health with your ear drums and the brain. Certainly very impressive in how well it has been made and of course reducing noise pollution is one of my top priorities that get overlooked so often. I also discuss this on the main page here.